Gratitude Gourmet sent me their new Vegan Chocolate Sampler to test out. How could I refuse? The chocolate is fair trade and made in California. 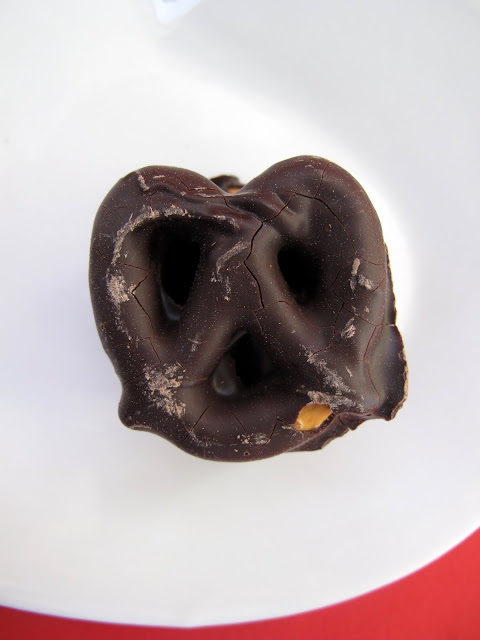 Inside is a nice variety of chocolates, jellies, pretzels and even coffee beans. So let's open it up and take a look! My favorite of the five selections was the Orange Batons. I've never had anything quite like it before. It's a long orange jelly dipped in chocolate. The citrus flavor mixed with the chocolate is heavenly. 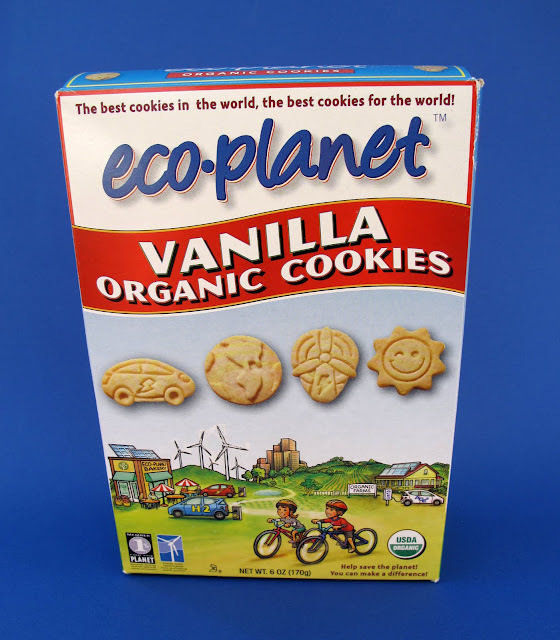 I wouldn't mind a whole box of these! 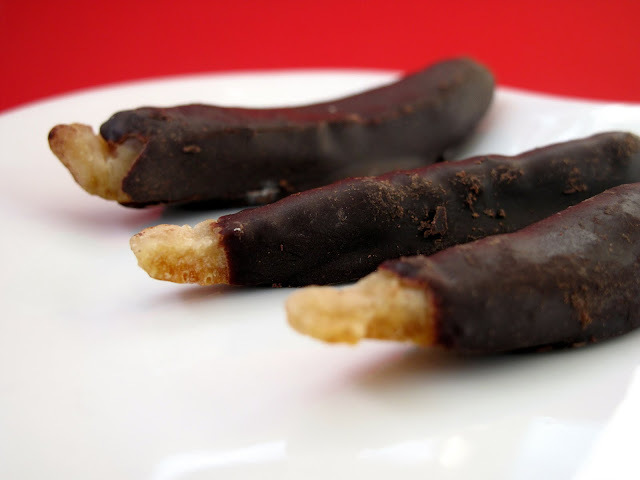 Chocolate Coated Pretzels. I found these to be just ok, your average pretzel with chocolate. Not bad mind you, just saying. 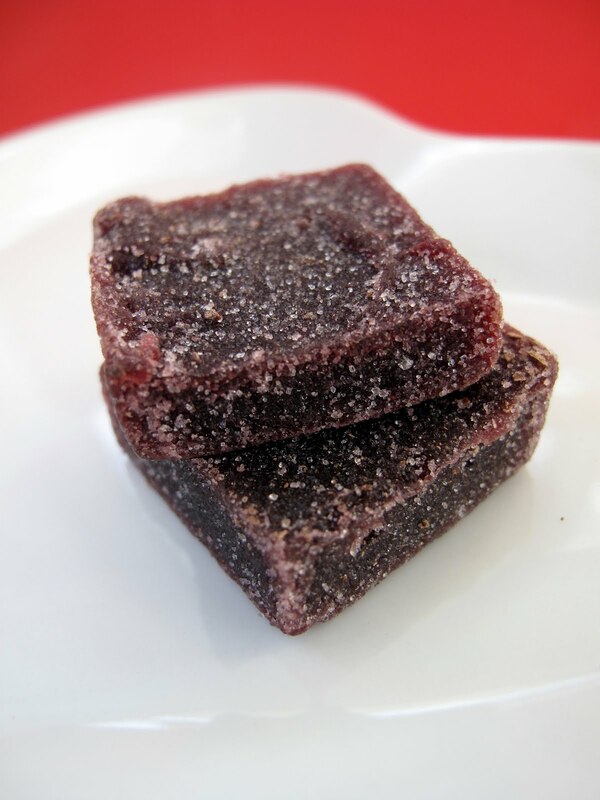 Fruit Pate de Fruit. These were a nice break from all the chocolates. Similar to the orange jelly, it's a raspberry jelly square. I'd love to try a box with different fruit flavors. Vegan Hazelnut-Berry. A nice mix of chocolate and berry jelly. There was a hint of hazelnut but a little bit more would have been better. Overall, though, I liked it. 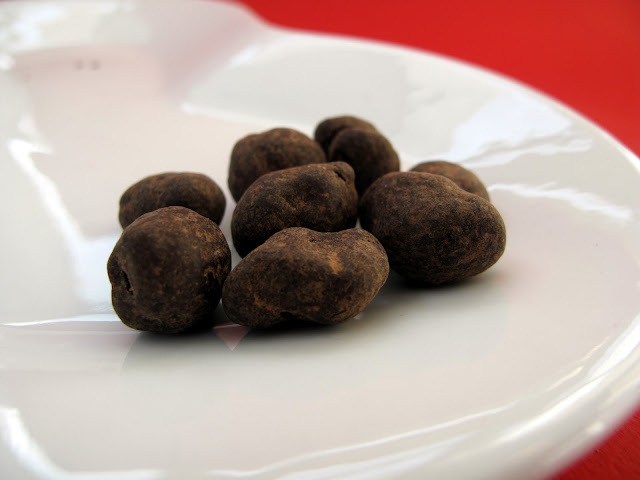 Chocolate Covered Coffee Beans. I'm not a fan of coffee AT ALL but I decided to try a couple. While I would never eat a ton of these, they did have an interesting flavor. I didn't even know you could eat coffee beans much less dip them in chocolate. 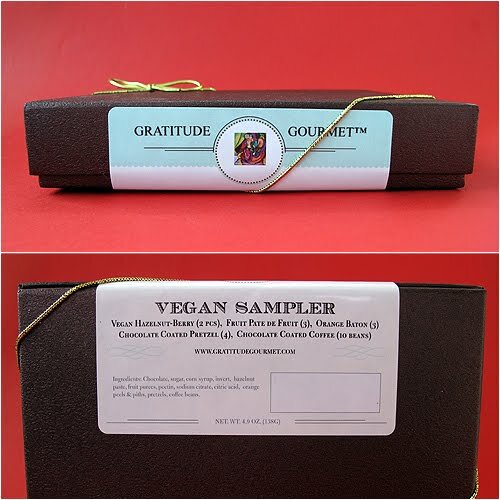 So if you are looking for a nice Vegan chocolate sampler for Valentines Day's, Gratitude Gourmet would make a great choice! 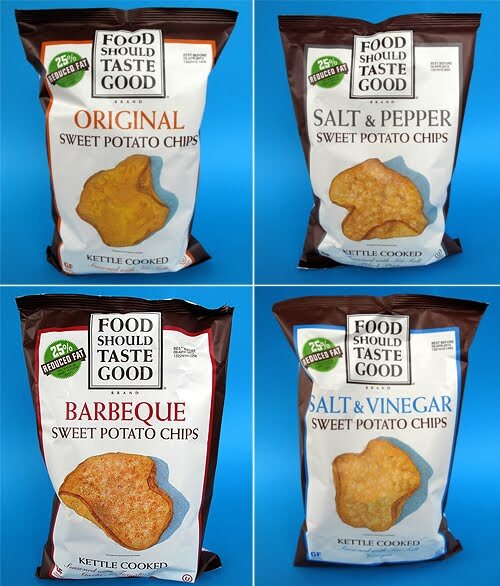 Food Should Taste Good is back with a brand new invention, kettle cooked sweet potato chips! And as luck would have it, all of the new flavors are Vegan. Definitely not your typical potato chips, sweet potatoes provide a hearty crunch and a sweet flavor. The four varieties are Original, Salt & Pepper, Barbeque and Salt & Vinegar. The first thing you'll notice is how thick and well seasoned the chips are. Plus the chips sizes were pretty nonuniform, which can be fun. I think the most amazing chips out of the bunch were the Barbeque. They had an abundance of BBQ seasoning which had a hint of brown sugar. Salt & Pepper were perfectly salty and peppery (duh). And Salt & Vinegar were very salt and vinegary (double duh). Original flavor will be your best dipping chip, which I tested out with Wayfare Hickory Smoked Cheddar and it was delish. So if you are looking for a chip that's a little different than your typical Lay's potato chip, you should check out FSTG's Sweet Potato Chips! On my last trip to Whole Foods, I noticed some of their 365 brand cereals were labeled Vegan right on the front of the box. That really makes my job easy so I decided to grab the most appealing cereal (to me anyway). I lobbed the Peanut Butter Balls box right into my cart. I guess you could describe them as peanut butter Kix. I thought they were great! A nice peanut buttery taste and not too sweet. 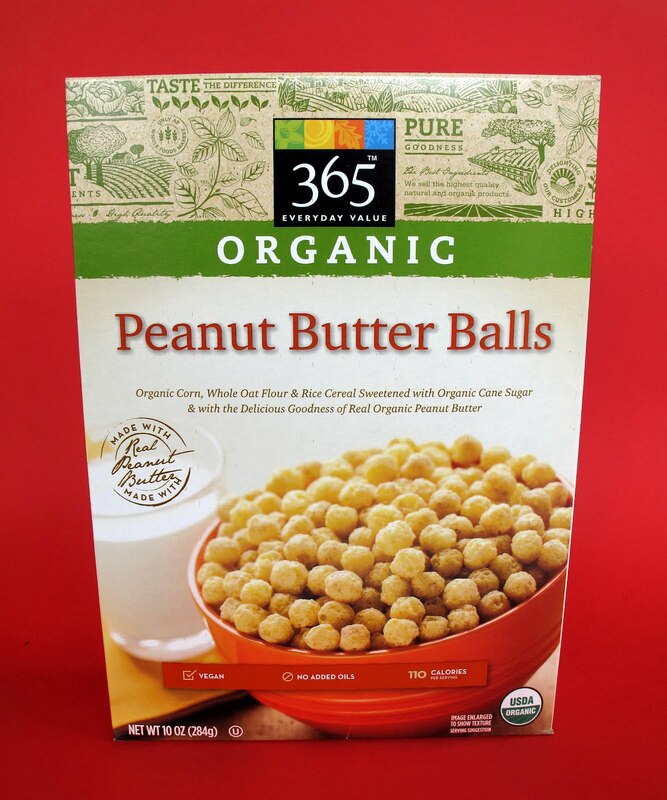 It says on the box that they are organic and made with real peanut butter, which is a nice touch. Compared to the other pb cereals out there, I'd say Peanut Butter Balls holds its own. It doesn't really bring anything mind blowing to the table, but being the 365 brand, it's fairly cheap. So if you are a peanut butter connoisseur, a lover of organic and natural ingredients and a cost conscious shopper, this is the cereal for you! Just a routine leisurely stroll to our neighborhood Hy-Vee grocery store revealed something very yummy in the frozen section. 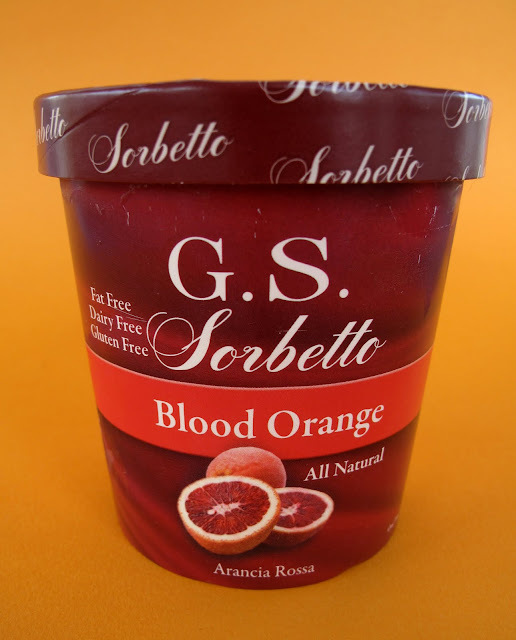 I noticed this pint of Blood Orange Sorbetto from G.S. Gelato. Flipping the pint around to look at the ingredients, I was happy to see the big V. I always assume that sorbet is Vegan and legit, but it's nice to see a company write Vegan on the packaging. I tend to like most sorbets, but this stuff is A-MA-ZING! Let it melt a bit and it gets creamy as all get out. The flavor was pure and delightful. The citrus from the orange is intense and it tastes really fresh. I have no doubt G.S. 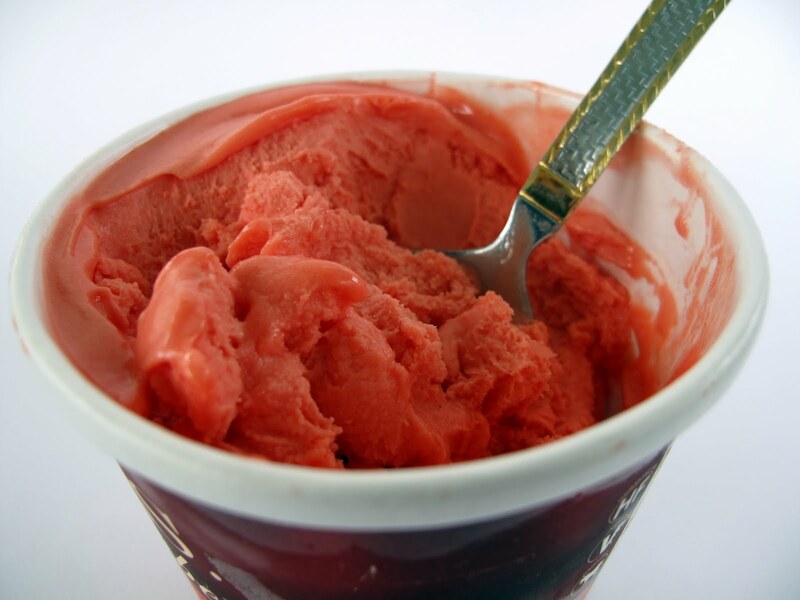 Gelato uses high quality ingredients because you can taste them. This might be the best sorbetto I've ever had. If you see it in the stores make sure give it a try, I have a feeling you'll fall in love! These two new cereals from Nature's Path recently caught my eye and I thought I would see what they're all about. Both cereals are organic, gluten-free and have a wide spectrum of ingredients. Corn, rice flax, quinoa, buckwheat and amaranth. If you read my blog regularly, you probably noticed that I'm not a big breakfast person. But if I wake up in the middle of the night and need something to eat, is there anything better than a bowl of cereal? 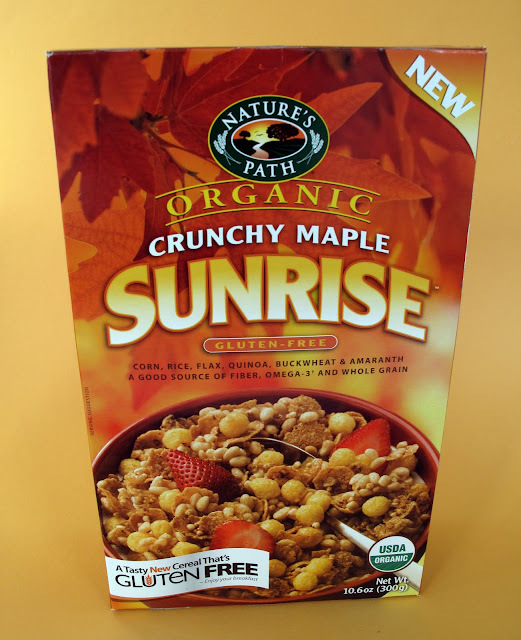 First up is the Crunchy Maple Sunrise. I hope you like maple cause that's what you're gonna get. Strong maple flavor throughout the mixture of flakes, puffed rice and corn balls. It's a fun cereal to eat because of all the different textures. Like some crazy combo of Kix, Rice Crispies and Corn Flakes! The Crunchy Vanilla Sunrise is the same texture wise as the Crunchy Maple but obviously it's vanilla. I'm gonna say this was my favorite of the two because the vanilla flavor was a little bit more low key. For the record, I used my favorite non-dairy beverage, Unsweetened Original Almond Breeze. I would suggest using something unsweetened so as not to muddle the flavors. 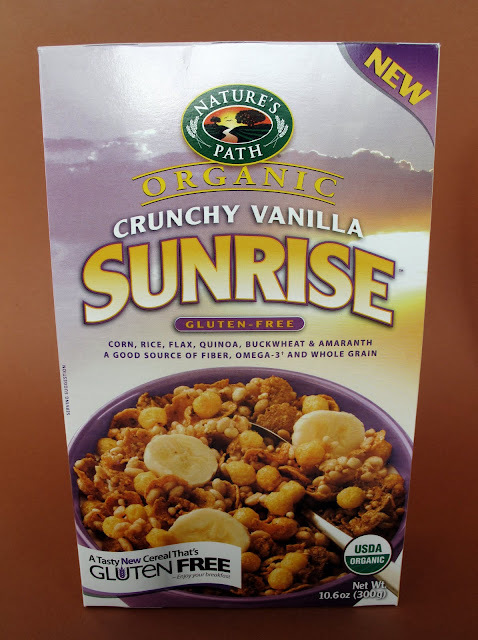 So if you like your cereal with bold flavors and lots of different shapes, I think you'll enjoy Nature's Path Organic Sunrise Cereals! I spent New Years in Columbus, Ohio with my girlfriend's family. It was a good time and a great way to start 2012. One of our nightly activities was eating bagels and ice cream at midnight. Admittedly, the ice cream consumption was mostly by me, but everyone ate bagels. It was decadent and fun! While eating the bagels and ice cream we watched The Golden Girls, Law & Order and tons of the I.D. Channel. I became addicted to bagels and now it's all I ever think about. A bagel with Earth Balance or a bagel with Tofutti Cream Cheese. Or shoot, even a plain toasted bagel. 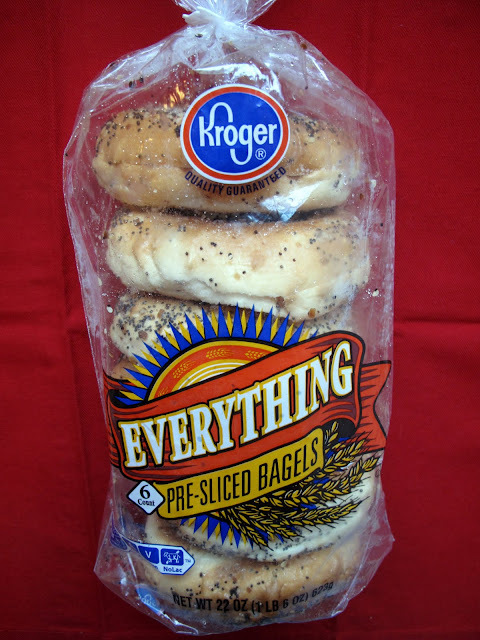 Everything Bagels from Kroger was the bagel of choice. They were amazing toasted and had great flavor. Plenty of poppy seeds and dried onion. I think we went through three bags! 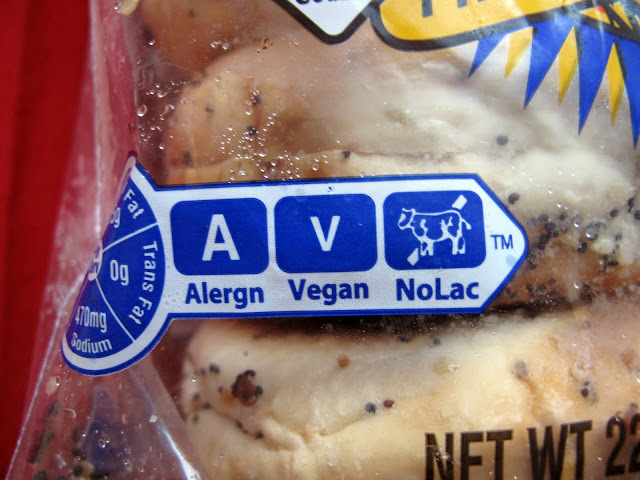 And the coolest part about these bagels is that they say Vegan right on the package. How awesome is that! I wish every grocery store in America would start labeling like this. Maybe in 5 to 10 years? I hope soon. I'm still on my streak of frozen rice milk desserts and my next conquest is the Good Karma Organic Rice Bar, specifically the Very Vanilla flavor. As far back as I can remember, I've been addicted to what we call in these parts "Star Bars". That is, vanilla ice cream bars dipped in chocolate. So let's take it back to 1986 and grub down on some ice cream bars! 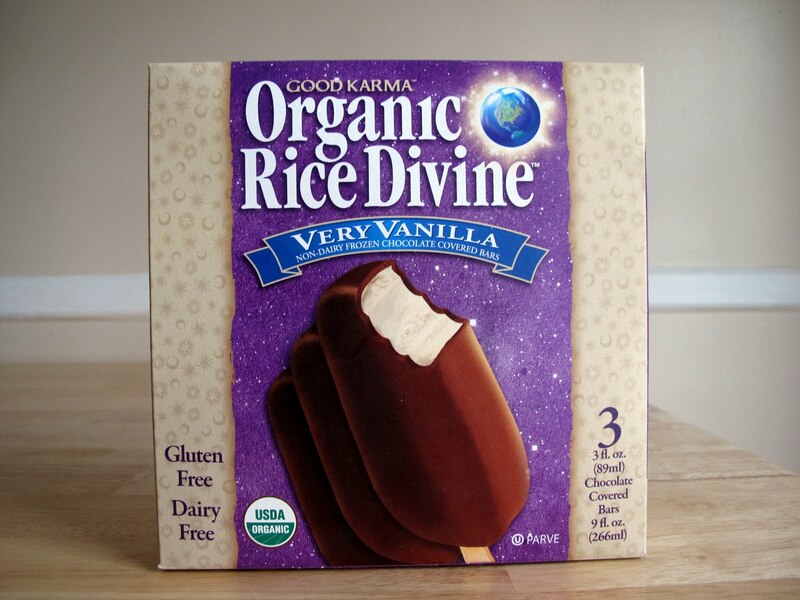 If we took the Pepsi Challenge and put the Good Karma Bars against traditional chocolate covered dairy bars, I'd bet the Good Karma ones would win. They taste surprisingly refreshing. The chocolate is rich and crispy and the ice cream vanilla-y. You might notice a slight rice taste but this jaded Vegan reviewer finds it delicious. So be on the look out for this yummy frozen treat! Vegan beef jerky is alive and well. In this blog post alone there are 4 different brands and I'm sure there are many more. What is your favorite and which ones did I miss? Stonewall Jerquee is personally my favorite. I like how small and chewable they are. Some have called it dogfood (Katie) but it tastes delicious to me. Let's put it this way, I bought the 5lb Original Mild bulk bag from Vegan Essentials, TWICE! The eight available flavors are Original Mild, Teriyaki "Beef", Tandoori "Chicken", Original Wild, Spicy "Chicken", Peppy "Pepperoni", Hot "Pastrami" and Cajun "Bacon". 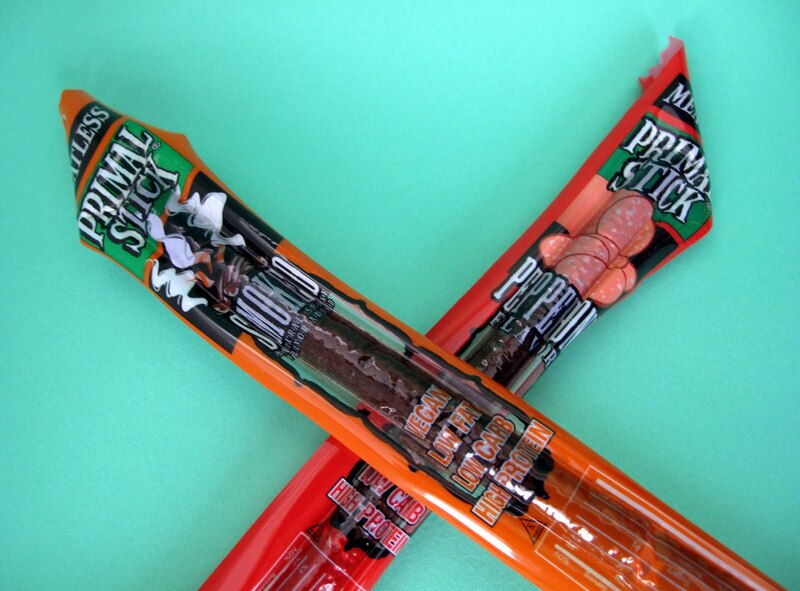 Primal Sticks are good if you like sausage style beef jerky, ala Slim Jims. 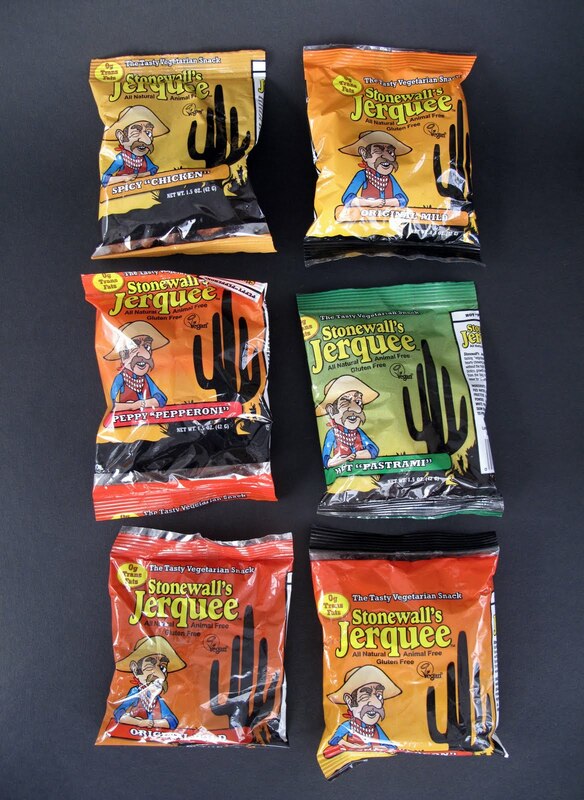 They are long ropes of jerky goodness. The two available flavors are Hickory and Smoked. 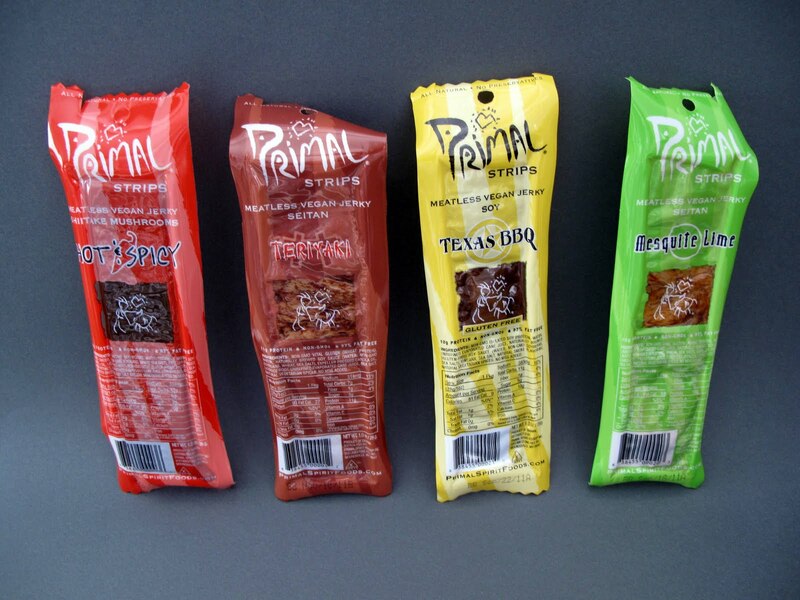 Primal Strips are pretty much the complete opposite of Primal Sticks. Juicy, flat and soft. And they are a little easier to fit in your back pocket. The six available flavors are Hot & Spicy, Teriyaki, Texas BBQ, Mesquite Lime, Thai Peanut and Hickory Smoked. Vegan Dream Jerky is like old school thin jerky that is hard to tear. I happen to like this style of jerky. I haven't seen it in the stores anywhere so you'll probably have to order it. The four available flavors are Hickory Pepper, Cowgirl, Chili Pepper and Teriyaki. 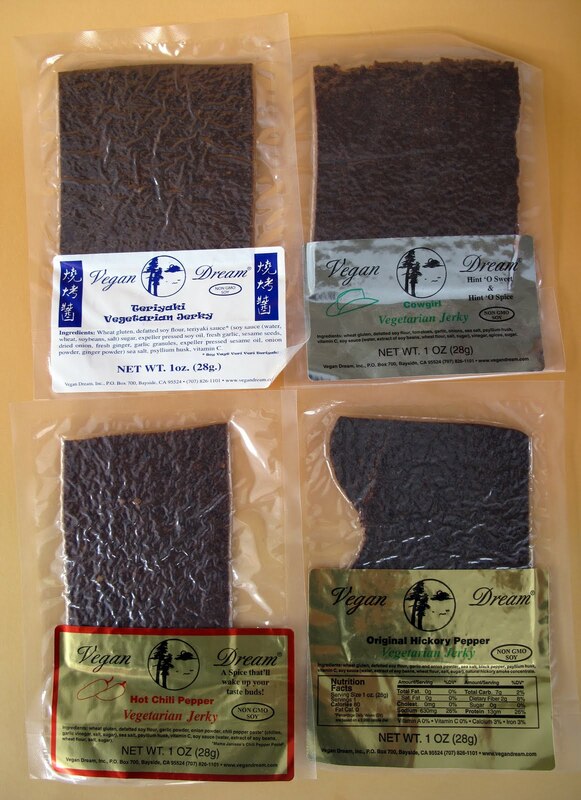 So no matter what kind of jerky you like, there's something for everyone in this jerky world! *UPDATED 10/18/2014* It would be a crime not to mention Louisville Vegan Jerky Co. as it is my new favorite Jerky! Leigh Saluzzi is the co-owner Cosmo's Vegan Shoppe. 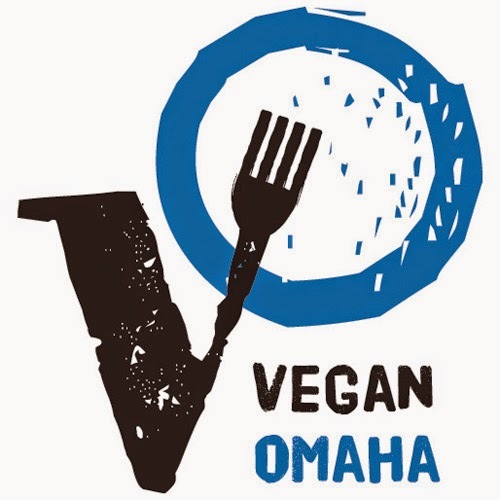 Founded in 2005 with her husband Ken, Cosmo's Vegan Shoppe is one of the largest Vegan online stores in the world. From non-leather wallets to gelatin-free gummi worms, Cosmo's has everything a Vegan could want. So it's natural that Leigh has the inside scoop on the best of the best. 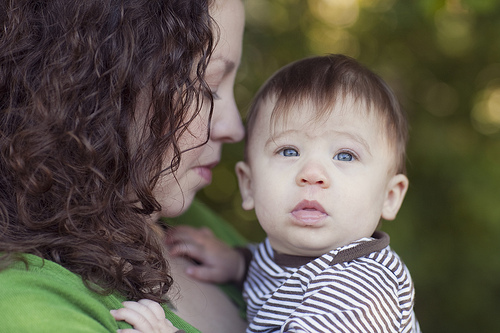 When Leigh is not busy at work, she is raising her newborn baby Luka and attending any Tori Amos concerts in sight. So in proud memory of Cosmo the Cat, Leigh brings you The Laziest Vegans Top Ten! I'm really into the Dr. Praeger's California Veggie Burgers. It's the only time I knowingly eat peas! I don't usually like frozen meals very much, but I recently tried the Candle Cafe Ravioli and they were crazy good. Ooh, I love so many vegan ice creams. 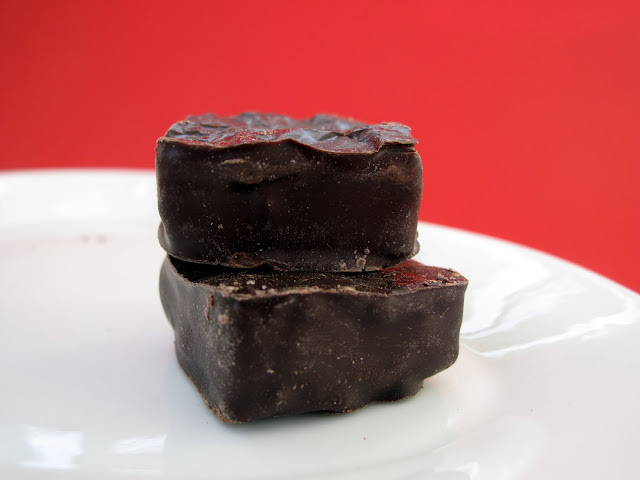 Maybe the Coconut Bliss Chocolate Hazelnut Fudge could be my favorite. Kookie Karma Cheezy Kale Krackers. Even though I hate that they spell crackers with a K. Also, they aren't really crackers. But they are delicious! Kashi Strawberry Fields. Until a good vegan version of Cap'n Crunch comes out, anyway. Go Max Go candy bars find their way into my mouth a little too often. But I do work around them all day. The Twilight bar is fantastic. Liz Lovely Cowgirl Cookie, no contest. 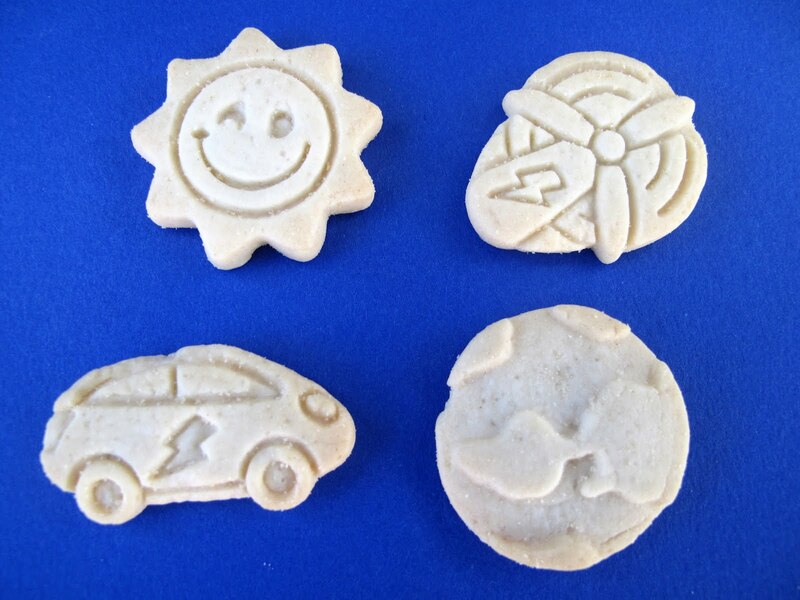 Best packaged cookie in the history of cookies. Could I cook on the island? If so, send me with Daiya. Melted Daiya could make any survival food more tolerable. Field Roast Frankfurters. In fact, just send me with a Field Roast variety pack. I love all of their stuff. And I could melt the Daiya all over them. Then, Tofutti Cream Cheese. Wait- are there bagels on this island? Surely there are bagels. Name a product you would like Veganized? Cinnamon Rolls in a can, like Pillsbury with the little icing tub. Also peanut butter baking chips. Why do those not exist? Our store is pretty cool, Cosmo's Vegan Shoppe. 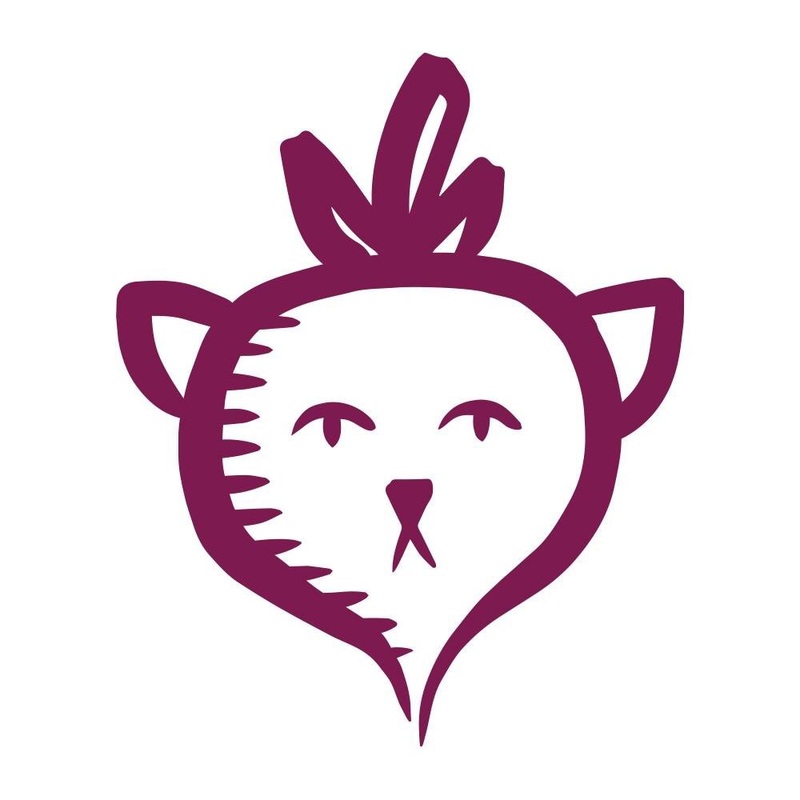 We also love the folks at Herbivore Clothing and Food Fight Grocery. And that concludes The Laziest Vegans Top Ten. Thanks Leigh! 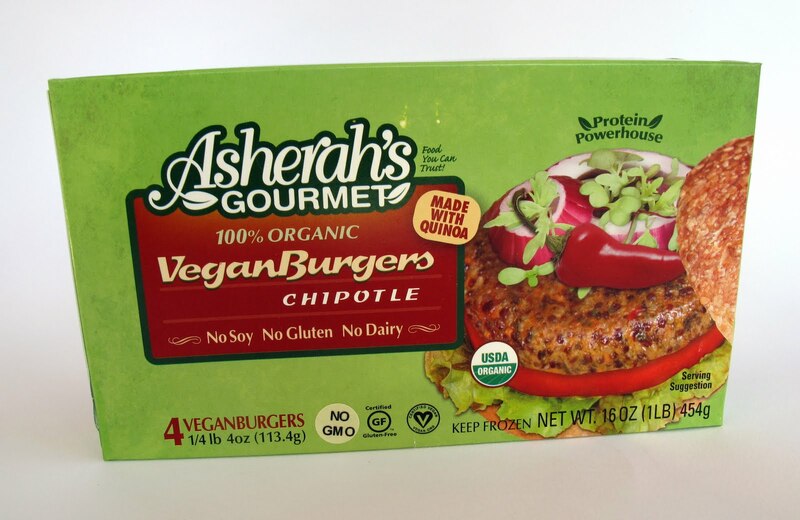 New to me is Asherah's Gourmet Vegan Burgers. You can find them in Natural and Chipotle flavor. For this review, I purchased the Chipotle. I'm impressed that they use all organic ingredients and are gluten free. The main ingredient is every Vegan's friend, quinoa. 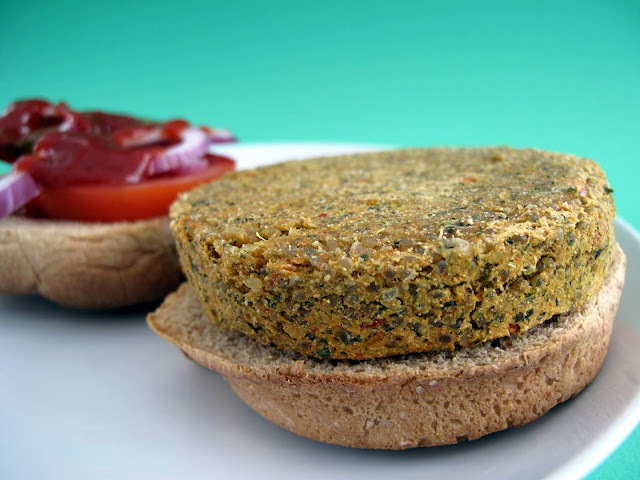 So what does a quinoa burger taste like? Let's see! My first impression is that the burger patty is huge! Asherah sure didn't skimp on the size. The flavor was spicy but not overpowering. The texture was crispy on the outside and soft in the inside. I ate it with my normal condiments but it was flavorful enough to eat it plain. I did notice they cost bit more than your normal veggie burgers but the size and unique flavor make it worth it. So if you are in the market for a gluten-free burger, make sure to give Asherah's a try!